What's the big deal about solar eclipses? Seen one, seen 'em all. Why would you travel more than 18,600 miles for two minutes of totality? These are the questions friends and family ask when they hear you just returned from an eclipse expedition (and are planning the next one). 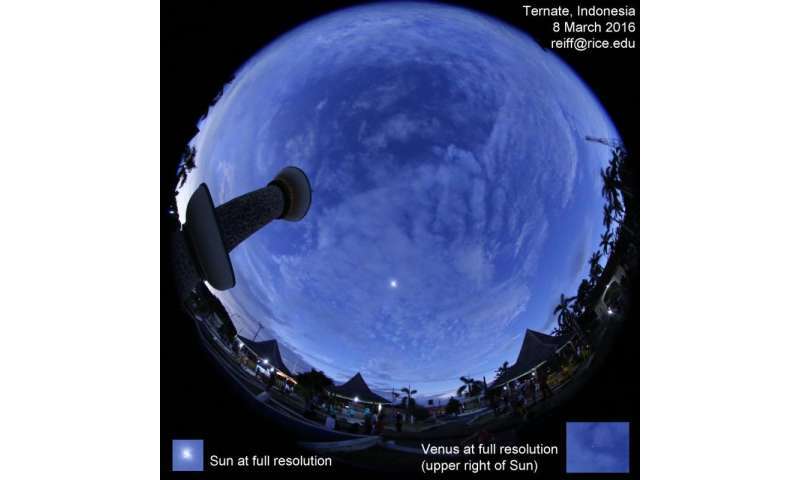 I spent my spring break this year in Indonesia for a total eclipse, visiting Bali, Jogja, Krakatoa and other sites and viewing the eclipse March 8 from Ternate. Umbraphiles (literally "shadow lovers") travel thousands of miles over many days to get a few precious minutes in the moon's shadow. If you are unlucky, the sky might be cloudy just at the wrong time … or even raining! But if all goes well, you are treated to one of the most amazing experiences that nature has to offer: a total solar eclipse. A solar eclipse happens when Earth, the moon and the sun align exactly. This happens during "new moon," but not all months have eclipses because the plane of the moon's orbit around Earth is tilted with respect to the plane of Earth's orbit around the sun. Only near the "nodes" (the intersections of the two planes) can the moon's shadow touch Earth. The moon is about the same angular size as the sun (a half degree in the sky), so the moon can block it out entirely if you are in the exact right place at the exact right time. Since the moon is only 1/400th the size of the sun, it must be 400 times closer. So what do folks see during a total solar eclipse? First, the moon begins to cross the face of the sun. That instant is called first contact. The magical "diamond ring" occurs when the final piece of the sun is still visible. This lasts just a moment and then totality—second contact—occurs. 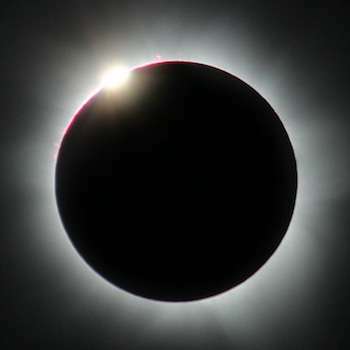 Only then can you take the required special filters from your eyes and see the amazing total eclipse in its full glory, and only for the time that it is total at your location, which can be from a second to nearly 8 minutes. Totality is a full-body experience. Although there are many excellent photos of totality, seeing it for yourself is much more dramatic. As totality approaches, the sky gets darker. It's really hard to notice the difference until the sun is 90 percent covered. Then you notice the sky seems gray, not blue, and the shadows all seem very sharp. Birds may start to roost. The temperature may fall by several degrees, and the wind may pick up. Street lights come on. It's an eerie feeling, and for many, a spiritual experience. The eclipse looks huge in the sky, because the corona adds up to several times the sun's diameter. Some folks stare so intently they forget to use their binoculars! That's too bad, because through binoculars, you can see the prominences that leap up from the edge of the sun, the bright inner corona and the wispy outer corona, all at the same time. It's a magical sight, just not the same in photos. Those that show detail in the prominences are taken with a short exposure and can't show the outer corona. Longer exposures that show the outer corona overexpose the prominences. So the eye, preferably aided by binoculars, is the best tool. All too soon the totality ends. This is the third contact. The chromosphere flashes, and then you may see "Bailey's beads," caused by pieces of the sun peeking up behind mountains on the edge of the moon. Then the diamond ring reappears as the sun emerges. Is it really over so quickly? Tears of joy are common. 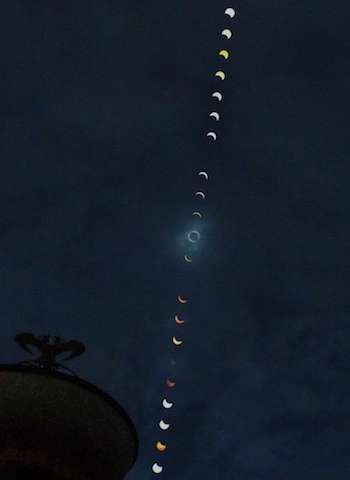 Those who want to capture the whole sequence stay for that last hour that the moon finishes its travel across the face of the sun, ending at fourth contact. Others embrace and take selfies with the still partially eclipsed sun on their faces. And the discussion begins: Which one are you going to see next? For Americans, it's been a long dry spell since the last total eclipse crossed the United States in 1979, but a great one is coming next year. On Aug. 21, 2017, a total eclipse will cross the continent from Oregon to South Carolina, and folks are already picking their observation spots. Hotel space is already gone at many great sites. Because the orbits of the moon and Earth are ellipses, the moon sometimes appears larger than the sun, leading to a very long eclipse. Other times the moon appears smaller than the sun, and even if you are in the right place, the sun is not completely covered, leading to a glowing ring of sunlight around the moon. In those cases, called annular eclipses, it is never safe to take off your special solar filters, and you don't get to see the corona. I don't really travel to those anymore; I save my eclipse travel funds to see totality! And no, they are not all alike. At solar maximum, the corona is symmetric around the sun. At solar minimum, the corona is extended along the sun's equator. Eclipses that occur near sunrise or sunset can have lovely reflections along the water or placement near interesting objects. Eclipses that occur near noon are best to see the moon's shadow racing toward you at 1,000 miles per hour, like a black tornado. Clear skies can show "shadow bands." Cloudy skies can often thin out at totality just enough to see through a bit, or it can be raining. Even in cloudy conditions you can experience the change in the wind, the darkness of the sky, the change in temperature and the creatures heading for bed. So if you haven't seen a total solar eclipse, make your plans! The 2017 eclipse will be one of the easiest to see in a long time. The Houston Museum of Natural Science is reserving hotel space in Casper, Wyo., and many other operators have tours planned, and I frequently am a guide. Or just find a good spot on the center line, but be sure to be inside the path of totality. There's an interactive map of the eclipse at http://www.eclipse2017.org/ and other sites. In the meantime, you can see a video of totality from this past Indonesian eclipse at www.facebook.com/Trigger.MMS/ and learn more about eclipses at space.rice.edu/eclipse/. Lincoln City, Oregon, USA. 2017. Be there! Sadly will be only a 2.5 minute total eclipse in Oregon on the Pacific coast, while totality will be somewhat longer near the east Atlantic coast.